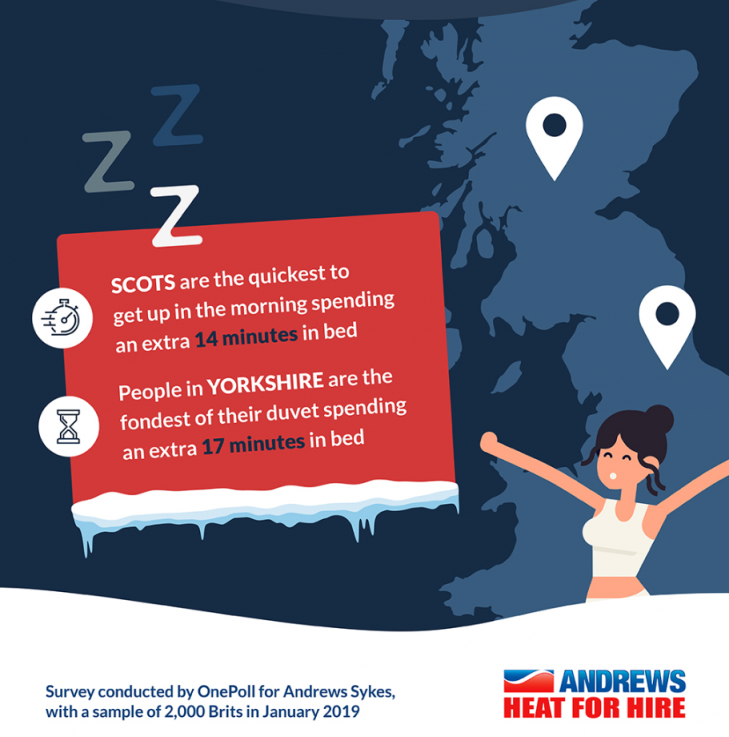 A recent survey conducted by Andrews Heat for Hire has revealed that the average Briton spends an additional 24 hours in bed throughout the cold season. People’s reluctance to confront the early morning cold causes them to hit the snooze button and delays the inevitability of actually getting out of bed, according to the findings. 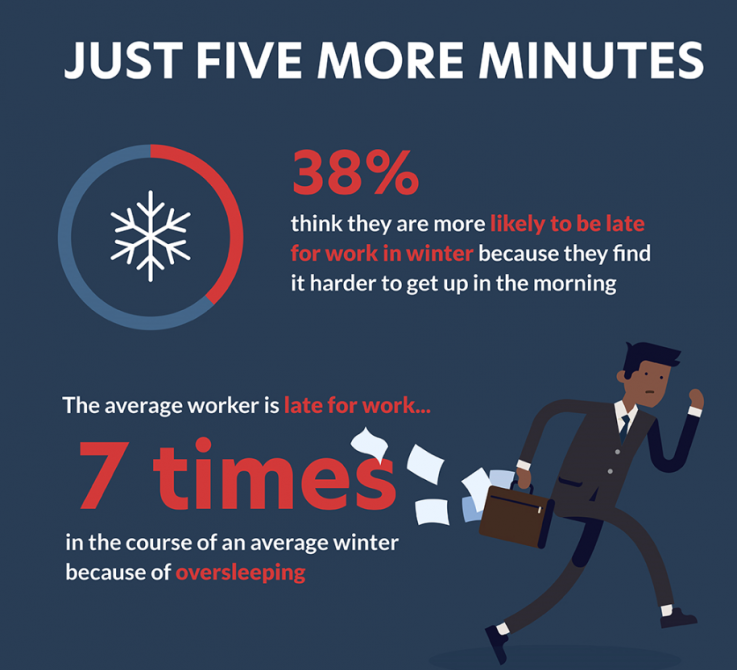 Of those asked, 38 per cent of employed respondents said they were more likely to be late for work during winter because they found it harder to get up in the morning. Statistics reveal that an ordinary person will be late for work seven times as a direct result of oversleeping, with 20% of those asked admitting that they’ve feigned illness to have a duvet day. Following the revelations, an Andrews spokesman concluded: “Darker, colder mornings can make waking up in winter months more challenging than any other time of the year. Breaking it down further, it transpires that the Scottish are the quickest to get up when the weather’s bleak – possibly due to the fact that most residents are used to a slightly worse climate than some of the UK’s more southerly regions. 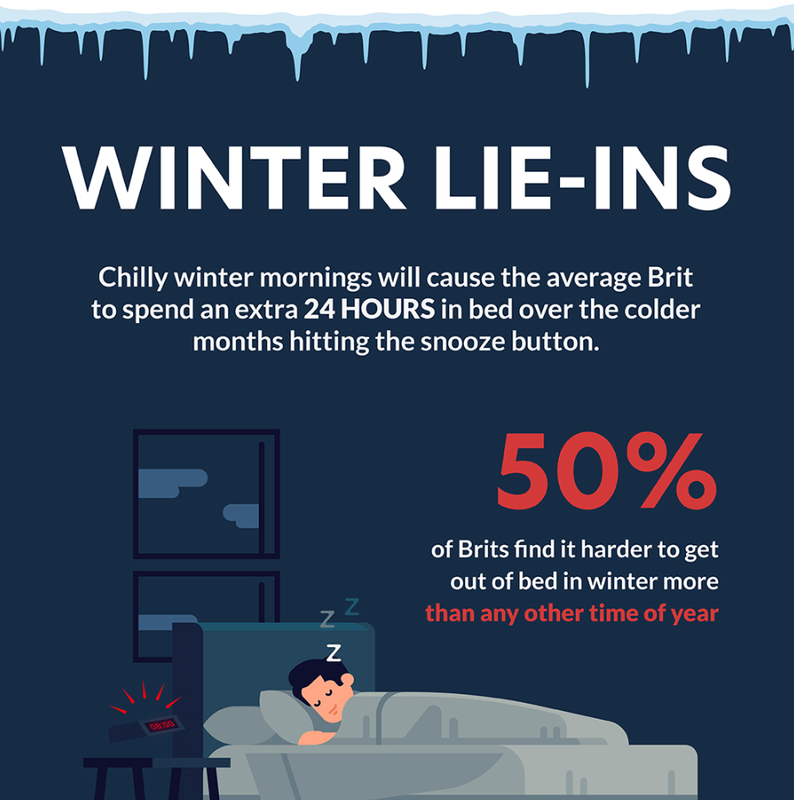 On average, the Scots spend an extra 14 minutes in bed when it’s cold outside. We found that those in Yorkshire are least likely to be quick risers, taking 17 additional minutes to rise. One in two British citizens concede that they find it more difficult to get themselves out of bed in winter compared with any other time of the year, with a third admitting they are more likely to hit the snooze button when the mornings are dark and cold. 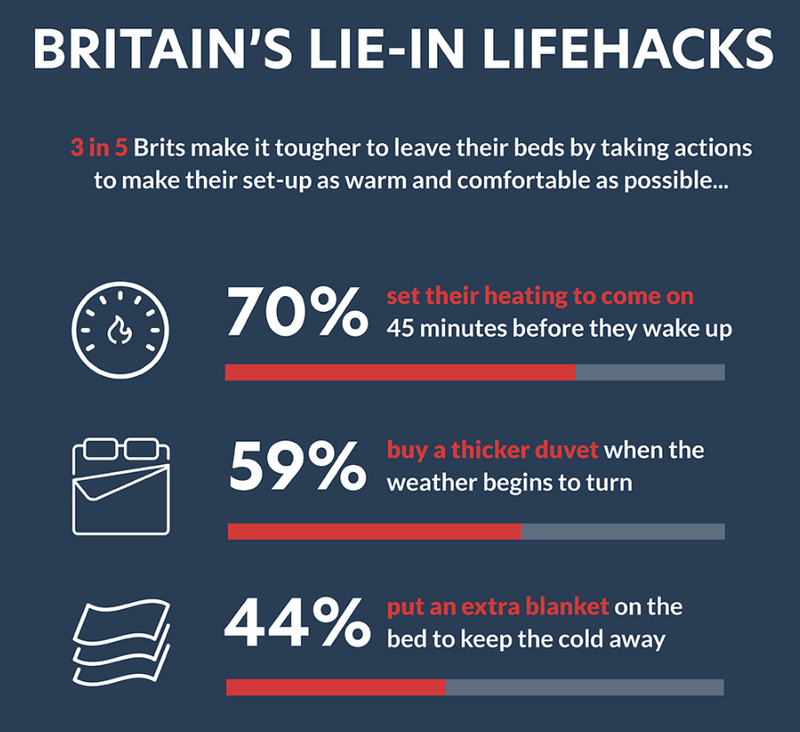 More than two in three of those asked say the lure of staying under the duvet is too tempting to turn down when it’s chilly outside. It may seem slightly trivial but the link between bitter weather conditions and tardiness is plain for all to see. 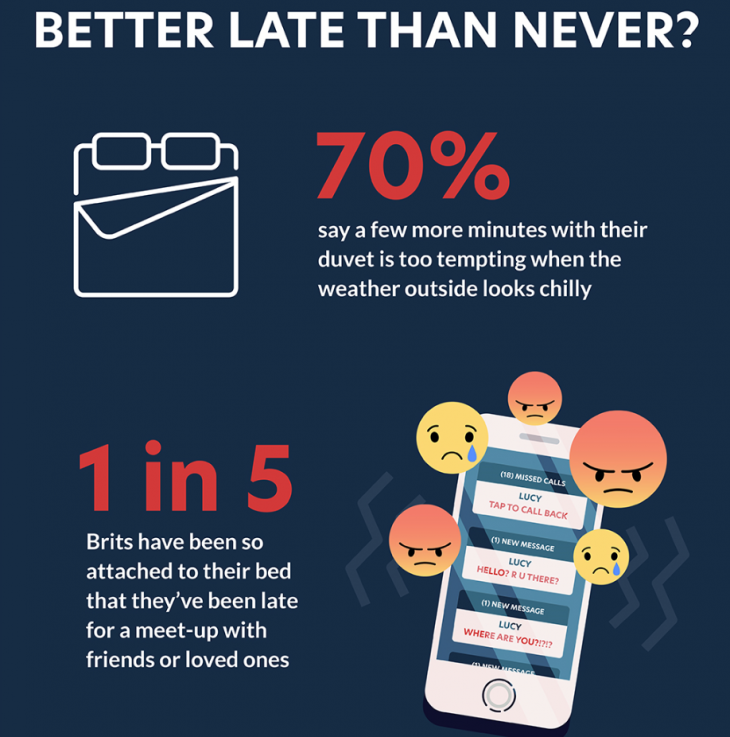 With a cold snap predicted over the coming weeks, it seems there’s a very real likelihood that an extra few minutes in bed will become too inviting for the average person to turn down. And the study shows that this tendency can often manifest itself in people being late for work or social occasions. 1. Generally, how easy or hard do you find it to get out of bed at each of the following times of year? 3. Do you find it more or less difficult to get out of bed when the weather is cold compared to when it is warm? 4. 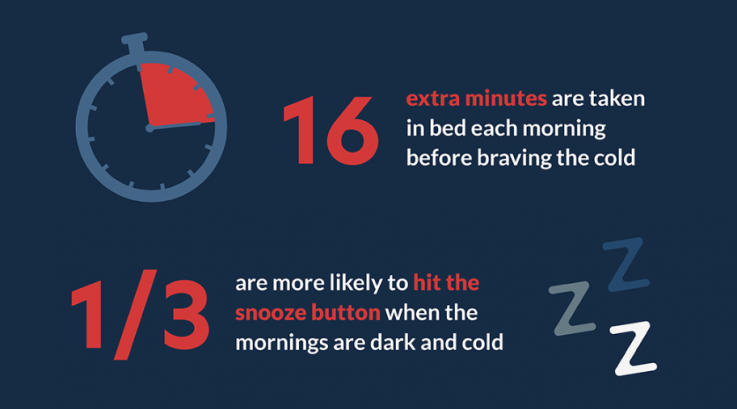 Do you find it more or less difficult to get out of bed when the mornings are dark compared to when they are light? 6. Which of the measures below do you take to make your bed warmer in the winter months? 7. Have you ever been late for a social gathering or meet-up with friends during the winter months because you couldn’t tear yourself away from the covers to brave the cold? 10. Are you currently employed? 13. Have you ever called in sick to work, just because you wanted to spend a day with your duvet? 14. Do you find it more or less difficult to work in the winter months compared to the other months of the year? 15. Do you think you generally sleep more or less in the winter months compared to the other months of the year? 16. Which of the behaviours below do you think you observe in the winter months? 17. Which of the below best describes you? 18. Do you tend to put your heating on in the morning in winter? 19. Do you generally set the heating to come on before you wake up so it’s warm when you need to get out of bed? 20. How soon before you wake up do you set the heating to turn on (and continuously be on)? Please select best match in minutes where 180 minutes = 3 hours, and 240 minutes = 4 hours. This article was posted in Brief, Heater Hire, News and tagged Andrews Heat for Hire, Andrews Sykes, UK weather. Both comments and trackbacks are closed.